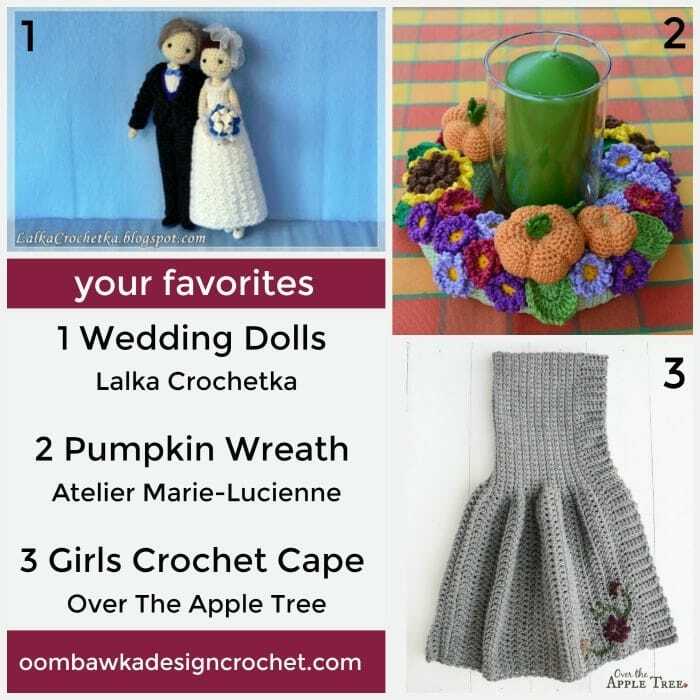 This week your favorites include a festive Pumpkin Wreath, a beautiful Crochet Cape and a keepsake set of Wedding Dolls. If the pattern links are not included when you visit their posts just leave the bloggers a comment (on their websites!!) to let them know you are interested – you never know – they may have a pattern they are perfecting to share with the world! Here are your featured favourites from last week’s Link and Share Wednesday – Link Party 157 as chosen by you! . I couldn’t find an actual pattern for the Pumpkin Wreath, though I’m sure I can make one from the photo (I already have a number of appropriate flowers made). It’s beautiful!